W-INVITE is located in the heart of Wageningen on the edge of the center. We are very easy accessible, so the Limo can drop you easily in front of the hotel. Due to our private ample parking area also your guests can easily park nearby. Starting from the entrance you are immediately surprised by the warm welcoming and the modern decorated hotel & conference centre. Not only the ceremony, but also the dinner with a spectacular party including an overnight stay can be organized by us. We leave nothing to chance, because we understand how important this day is for you. We therefore like to think along with you and it’s our pleasure to take over the organization of this day! Restaurant Beau 3111 ft2 / 289 m2 - 200 120 175 - Restaurant Beau started from the idea of bringing food back to its origins: pure, healthy and above all very tasty. We use fresh teas fair trade coffee and local ingredients. You can also enjoy our food and drinks outside on our terrace by the water..
Terraszaal 4263 ft2 / 396 m2 325 600 220 600 - - . Wolfswaardzaal 2239 ft2 / 208 m2 120 250 95 250 - - . 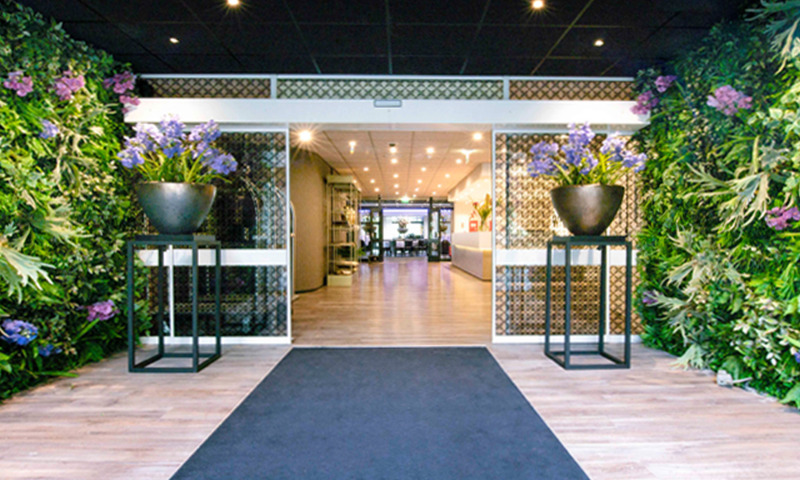 Review of Congres hotel Wageningen WICC Rating - of maximum 10 based on 0 reviews.